In a recent progressive listserv thread the question was asked: “Are more emails for organizations going to spam folders?” The answer is yes. Overall more email is being delivered to spam folders. According to ReturnPath, a leading company that measures email deliverability, nearly 1 in 4 messages never reach the inbox, with 7.4% of those going to spam. That’s 25% of emails bouncing, going to spam folders or being rejected by email service providers. And that’s costing your organization money and actions. The listserv thread I mentioned above was focused on Gmail, but the lessons I’m going to go over can be applied to messages sent to any email provider. ReturnPath reported on their blog that on or around February 10, 2012, Gmail tightened their spam filtering software. Their announcement backed up what I’d seen for quite some time – it’s getting more difficult to get your email in front of your supporters. I decided to look at some metrics that – as the man behind Salsa’s email deliverability – I get to see. The results were interesting, showing that for the past 6 months, there’s been a steady increase in emails going to spam folders – with a large jump from February to March. Since November there’s been an increase of 8% or more of emails going to spam folders. 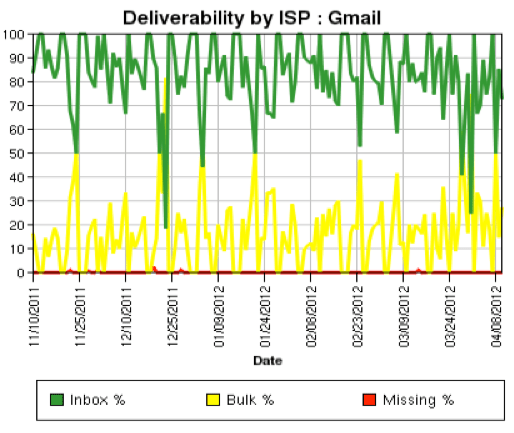 But, do we see the same results for global email deliverability? The answer is no. The data is showing that it is harder to deliver emails to Gmail’s inbox. But the question is why? We know that email service providers are paying more and more attention to how individuals react to the emails they receive. Opening, clicking, replying and forwarding all are good signs someone wants an email. A quick deletion without even looking indicates they’re not interested. A click of the spam complaint button means they really don’t want the email. We also know that email service providers look for key metrics. 0.1% is the number of complaints in a 24 hour period and 1% is the number of user unknowns in a 24 hour period before you crop up on the radar. 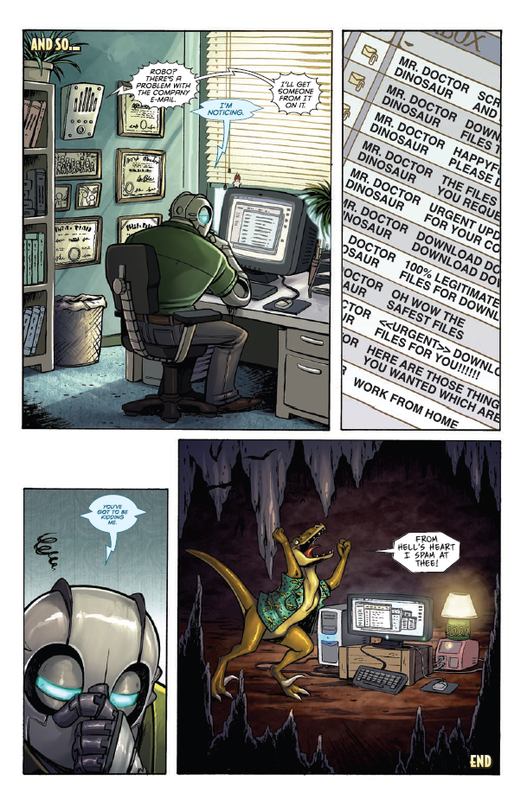 When those numbers are crossed, it’s possible that you’re in for a world of trouble. For every 10,000 emails you send, you are allowed 10 complaints and 100 user unknowns. If you’re running a clean program with opt-in individuals, you shouldn’t worry,. But non opt-in lists, stale lists, bad practices in general – could be costing you money. Good isn’t good enough anymore, you need to be great. But how much does this cost you? Here’s the math based on the stats above, using a 10% click rate and $1 a person who clicks (the last two stats I’m making up). You’re losing $80 per email blast in this scenario. Over twelve months that’s almost $1,000. Are those non-opted in emails that won’t open really worth it? What I’m going to suggest might sound drastic, but it’s the email program I run and this is on top of the do’s and don’ts as far as content. Make sure you’ve got the basics down – SPF helps prove you’re a legit sender; make sure you have that set up so it doesn’t look like you’re a spammer. No non opt-in individuals – Make it clear when an action is taken or donation is given so they’re now on your email list. Follow up soon’ish – As someone signs up, send them a welcome email or a receipt, especially if you don’t follow step 1. This will be their first opportunity to unsubscribe. Send emails supporters care about – make sure the emails you send are interesting to the individual. Pay attention to why they signed up in the first place to get for hints about what they care about and ask questions in surveys to find out more. Segment your list – Put action takers in one list and people who don’t respond in another. Send emails to active supporters first – think about the math above. If you hit the 0.1% early, the rest will have issues. Message differently – if someone isn’t showing any action (opening), then reach out to them with subject lines that might appeal to them. Try contacting these people through other channels like Facebook, Twitter or snail mail. If people don’t respond, cut the fat – This won’t be popular, but these people are making it more difficult to contact the people who care, so stop sending them emails and see number 6. They are costing you money! Pay attention to complaints and user unknowns – where are these people coming from? Find out and it might tip you off to sources you need to avoid and give hints for segmentation. Gone after one hard bounce – Salsa Labs only unsubscribes the “user unknowns”, we leave it up to you to unsubscribe the rest. Hard Bounces show that there is an issue with the email. So, like the deadweight I mentioned above, they should be removed. Furthermore, email service providers will hard bounce an email address and eventually turn it into a Spam Trap – which to the provider means it’s a non opt-in email and/or the list is not well managed. And overall, think about how awesome you’ll look when you’re bringing in more action takers and raising more money through your email list. Next Next post: Trading Lists is Bad…Mmmkay? !